This year’s Exponatec the ArtGuardian GmbH exhibits together with the HALBE-Rahmen GmbH and the werner murrer rahmen Company. Together the three companies present an innovation – the climate monitoring exchange magnetic frame combined with the possibility to hide the high-tech behind a historic ornamental frame. 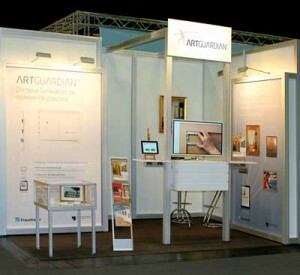 The technical realization is based on the ArtGuardian System which is already in the introduction into the market. Climatic data such as temperature, light and humidity, vibration and motion at the artwork, are recorded. The data is then relayed to a nearby base station. Thanks to specially designed browser-based software, the measurement values are available around the clock and from any location. Installation of the system does not require any software, configuration of local networks or complicated calibration. The unit is easy to use, with other advantages including additional features like an integrated alarm system and a settings assistant that helps users determine the optimal parameters for the artworks in question.